Imagine your perfect Hawaiian vacation. Beautiful beaches with no crowds and quaint historic towns with little traffic. Warm sunny days and tropical nights with seldom a shower. Time honored resorts that are reasonably priced and affordable Inns that are uncommonly elegant. If you think this vacation is a thing of the past, lost to the one-size-fits-all vacation packages, you haven’t been to Kona. Kissed by the sun, caressed by the sea. 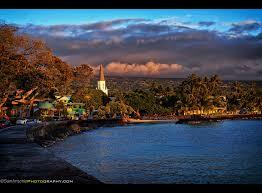 The center of activity on the Kona Coast is the historic seaside town of Kailua-Kona. A visitor delight, the town offers shops of every description and restaurants catering to any taste. Take a stroll along Alii Drive and pick up some gifts for the folks back home, or something special for yourself. Relax over a cup of world famous Kona Coffee or dine on fresh Ahi-tuna while overlooking lava shores and crashing waves. Kailua-Kona is alive with the history preserved and a hospitality never lost. You'll be enchanted with the safe, uncrowded streets, the easy pace and the friendly people.If you thought places like this didn’t exist anymore, then you haven't been to Kailua-Kona. Visit a genuine Hawaiian village, with all its charm intact!